Cards: Panini UT 2015 Patch, Pacific 2009. Score 2009, Upper Deck 2009, Press Pass 2009, Topps 2012, Score 2015*, Panini UT 2015, Donruss 2015, Panini Threads 2011. Acquired: IP 2018, GiGi’s Cupcakes Soft Grand Opening. 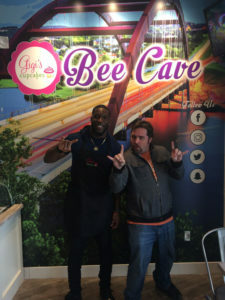 Brian Orapko and Michael Griffin had been hitting the social media circuit for a bit talking up their new joint venture- GiGi’s Cupcakes. Apparently when they both played for the Titans in Nashville they got hooked on the confectionary treat and decided that they wanted to be franchisees. Brian and Michael had posted some great photos of them cutting their teeth and learning the ropes behind the construction of their store in Bee Cave. Both of the alluded to a grand opening ‘in a few weeks’, so I kept my eyes peeled for any updates along the way. I just so happened to check their feed after I got back from the Bastrop Boot Event, and found out that Griff and Rak had done a soft opening that very same day. I was a bit miffed. The next morning I called them up, and was told that they were open today and come on down. I battled my way about 30 miles through the sometimes frozen rain to get there, but once I arrived I was greeted by a beaming Orapko and Griffin. 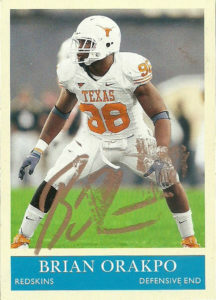 (I was really shocked as the last time I saw Rak, he was a bit disgruntled, and begrudgingly gave me his autograph.) I decided to get a 4-pack (only reserving the Red Velvet for myself) and asking him to choose the remainder for me. He filled out the box nicely over small talk and rang me out. 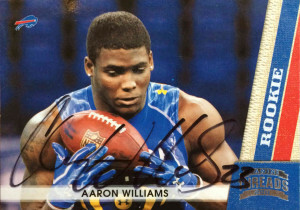 (Admittedly, it was a weird experience to have an NFL player working a register for me.) We even got in a good laugh over their instagram, as I wholly expected somebody to be tossing dough in the back like they were making a pizza. 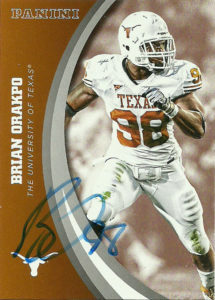 Brian had no problem signing these 2 cards for me. Heck, I probably could’ve gotten him to sign a few more- he was in such a good mood. Talking about going from worst to first. It was a great experience meeting him again. 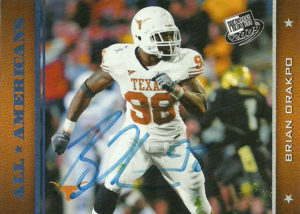 I even told him how I was hurt he signed with the Titans and not the Texans, and we had a good laugh at my expense over it. – And the best part: THE CUPCAKES WERE AMAZING. Later in the year I caught up with Spoodog and his wife. 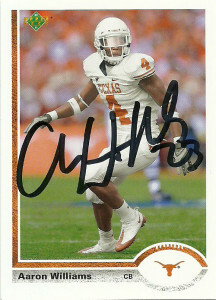 I hadn’t seen them in quite sometime- either a Priest Holmes signing or a Cedric Griffin signing well over a year ago. A lot had changed for me with a baby taking need over anything else and his job just sort of precluded everything else. It was great catching up with them. In fact a whole host of people showed up I hadn’t seen in a while. 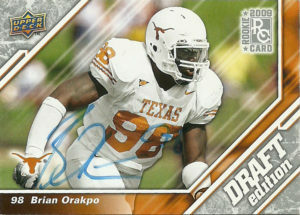 This made the wait for Orakpo even easier. It wasn’t much of a line at the T-Mobile location, but it was frustrating because we were told the wrong location and shuttled back and forth until we got to the right place. Rak was uneven at this event for me. I tried joking with him, and I let him know that I enjoyed the cupcakes, and heck that they may have been the first sugar my baby ever tasted, but I must have rubbed him the wrong way either through my joking manner or the fact that I asked him to sign 6 cards. I did give him a hard time about the Titans new uniforms. They look exactly like the CFL Toronto Argonauts. I took to calling them the Tennessee Argonauts. The pen also was giving up or he was signing lighter with each card. By the time he got to the Topps at the end, it was barely taking. He also was signing and just sort of tossing the cards at me. I felt pretty badly. 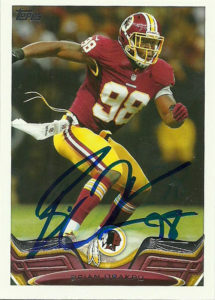 Oh well… A few friends of mine asked for future considerations to get Orakpo. Essentially what it means is that I’ll get the autograph free of charge, and they will look out for anybody me. I’m not picky as long as it is not in my collection already. (Lance and I have done these exchanges with regularity.) 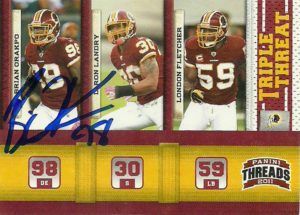 I went ahead and gave up the Score 2015- which I think looks terrible, and the Upper Deck 2009 Draft Edition, which I sorta wanted to keep- but this is how it goes. I hope these cards new homes appreciate them as much as I do. Later I went to the Back to Camp event that Brian was holding at GiGi’s before he headed off to Tennessee for the year. 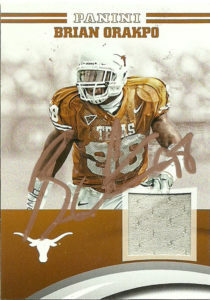 Many Longhorns were invited, but since I got there early, and had little time I only managed to get Brian and Michael Huff. I felt badly about how I had treated Brian at the T-Mobile event. He either took it in good stride or had already forgotten about me ribbing him about the Texans. He signed 3 cards for me. Well really 2. He re-inked the Topps 2014 that came out really badly, looked over the Panini Triple Threads card, and then tossed in his Donruss 2015 Sample card. He was really informative about the process of the league. New coaches get a little bit more time and Coach Vrabel wanted them in Tennessee to get ready for the season as soon as possible. Brian and I also talked about the sample card. Apparently many companies offer the cards to the players when they come out. 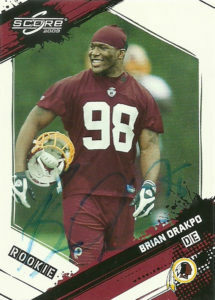 The Donruss card in particular was stamped/ imprinted on the back with the word ‘sample’ on it. Brian said that when he found out he had his first card, he was super excited because it was like a coming of age. 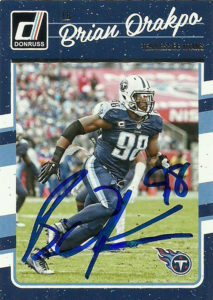 Brian signed with the Titans in 2015. By October of that season, he was already established as a team captain. 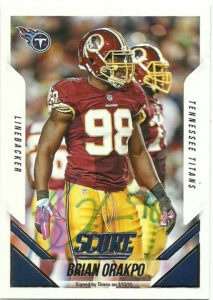 He finished his first campaign in Nashville with 7 sacks, 38 tackles (13 ast), 5 passes defended, and a forced fumble. 2016, saw Rak establish near career highs with 10.5 sacks, 38 tackles (8 ast), 4 passes defended, and a forced fumble. While his numbers were slightly down in 2017, Brian finished with 30 tackles (10 ast), 7 sacks, 2 passes defended, and 3 forced fumbles. With new coach and former LB Mike Vrabel in town, it should be interesting to see how Brian’s numbers stack up in 2018. 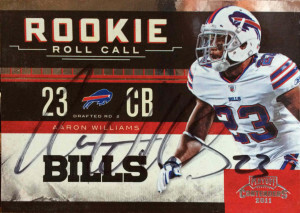 Acquired: IP, Aaron Williams Lone Star Showcase 2015, UT Coop Celebration 2016.
throwback entry they did of Williams. The Press Pass card left much to be desired however. 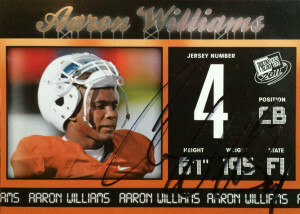 When I showed Aaron his Panini 2015 UT card at the Coop, he stopped to show Fozzy Whittaker how it looked. I knew he wanted one but unfortunately I did not have an extra. Shawn luckily had one to give him. I really liked the Lone Star Showcase. Williams crew ran a tight ship and the kids really appreciated the camp, event, and how it was run. Aaron started the LSC because he felt that if he just had the guidance and help earlier, he could’ve been a better player and teammate. In a sense this is his way of giving back. After the event, the best kids were given trophies. It was a really hot event, but it was worth it. Outside of the autographs, the highlight of the event was the DB WR drills and watching these kids go up one on one on each other. I really wish something like this had existed when I was a kid as there was no shortage of NFL talent on the field willing to help, teach, and encourage these youngsters. 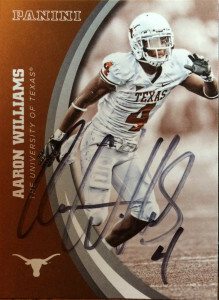 Aaron continues to be highly active in Central Texas hosting events, and making charitable radio appearances. 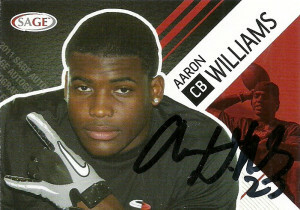 Aaron really blossomed into the heart and soul of the Buffalo defense. His knowledge and understanding of Rex Ryan’s defense was unparalleled. The strong safety was leaned heavily upon in the system, and as neck and concussion issues have impacted his playing time- it has had an adverse effect on the Bills defense as well. He’s been limited to 10 games over the last two seasons, posting 22 tackles, an interception, 8 passes defensed, and a fumble recovery for a TD. 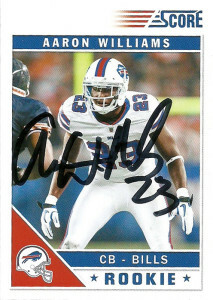 In March of 2017, Aaron Williams was released by the Buffalo Bills. He’s weighing his options as he hopes to continue his career elsewhere.